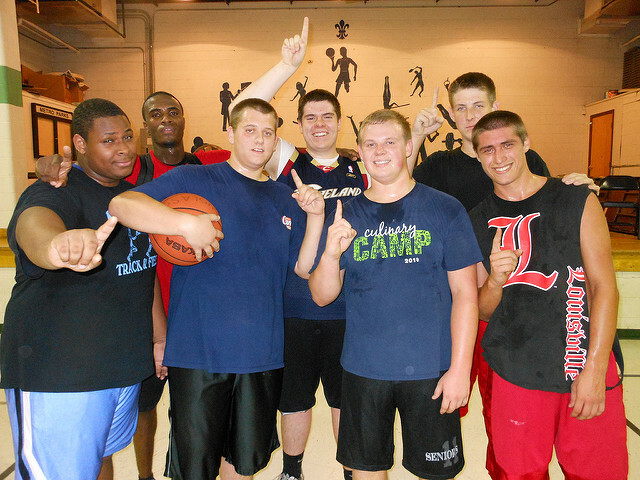 The purpose of Intramural Sports programs at Sullivan University is to provide a wide variety of activities to meet the recreational needs of the student body (regularly enrolled graduate, undergraduate students, faculty, and staff members). Flag football, Basketball (5 on 5), Volleyball and Soccer are provided for both men, women and co-ed. These are the core sports that are provided throughout the year, but feedback from the student body help in providing additional sports if the request is initiated by the student body. Each sport that is offered will have a season. At the end of each season there will be a tournament to determine a championship team or champion as the program progresses. Schedules of games, notice of special events, and announcements are posted in the Student Scene and in the Student Services office located in the main building, just outside the main lobby. Intramural extras are one night events that take place throughout the year. Typically, extras take place on Thursday nights at 7 PM. Most team events require attendance by a team representative at a Representative Meeting to discuss rules‚ policies‚ procedures‚ and other pertinent information‚ to ask questions and to receive schedules. Team representatives do not have to be team captains‚ but a representative for each team must be in attendance. Also‚ representatives may represent multiple teams. Times and locations for all Representative Meetings will be announced on the event poster and on this website. Most will be held in Room 154 on the Main Campus. Check the student activities calendar for events and their entry deadlines. The list of Intramural events can be found on the this website; in the Student Services office; on hallway posters and in the Student Scene. Obtain and complete the entry form including team name; division of play; team captain’s name‚ telephone number and email address; all players’ names‚ University student ID numbers‚ telephone numbers and other pertinent information. Entry forms may be found in the Student Services office. Complete the Intramural Event entry form by the close of the Student Services office on the deadline day. Roster may also be turned in to the Student Services office before the deadline day for most intramural events. Have a representative of the team attend any required Team Representative or Captain’s Meetings for the event. These meetings inform team members about event rules‚ policies and procedures and other event requirements. Pick up rules/schedule packets or check any posted schedules to be sure of the dates‚ times and locations of your team’s games. All part-time and full-time employed faculty and staff. For Co–Ed events only‚ spouses of currently enrolled students, faculty and staff may participate. For these events‚ the spouse must be on the same roster with their Sullivan husband or wife. Spouses may not stand alone on a roster. A valid Sullivan student ID‚ faculty ID or staff ID is required to enter and participate in all Sullivan intramural events. All students are required to present their valid Sullivan student photo I.D.s. All faculty and staff are required to present either a valid Sullivan faculty/staff photo I.D. or a another form of photo I.D. such as valid driver’s license. For Co–Rec events only‚ spouses of eligible students‚ faculty or staff must present a valid driver’s license in order to participate with their Sullivan husband or wife.